It is timely to look at what is a park home. Both park operators and local governments should consider the Henville decision when making, or determining, an application for a park home park licence pursuant to s.7 of the Caravan Parks and Camping Grounds Act 1995 (WA). The issue of whether a structure is in fact a park home is highly technical as this article demonstrates. Member Owen-Conway in the State Administrative Tribunal (Tribunal) has recently set out what constitutes a park home in Henville and City of Armadale  WASAT 108 (Henville). The issue in Henville was the refusal of the City of Armadale to grant a park home park licence to the applicant pursuant to s.7 of Caravan Parks and Camping Grounds Act 1995 (WA) (CC Act). One of the questions that arose for the Tribunal was whether the form of habitation to be provided by or permitted by the applicant on the property was a park home within the meaning of the CC Act and the Caravan Parks and Camping Regulations 1997 (WA) (CC Regulations). The applicant’s proposed ‘park home’ consisted of a habitable structure with short metal rollers attached to its lower supporting beams. It did not have standard wheels, an axle that extended across the structure, or a chassis. The structure could be rolled a short distance along metal strips laid on the ground with the assistance of the attached metal rollers and a heavy vehicle. The Tribunal rejected the applicant’s argument that all that is required of a park home, as defined by the CC Act and the CC Regulations, was that it could be moved within 24 hours of detachment from the services and components comprising the park home in order to establish the necessary limited degree of mobility asserted by them. The Tribunal also rejected the applicant’s contention that the form of habitation it proposed to construct was a ‘vehicle’, because it was not a means of transport. It was a habitable structure that could withstand only relatively minor movements from one location to another utilising the affixed metal pipe rollers. The Tribunal observed that the ability to roll the structure a short distance into the right point on the future lot was for the sole purpose of locating it onto the mushroom or donut footings required to stabilise it on the future lot. The rollers were not fixed to the structure to make it, and it was not, a means of transport. ‘vehicle’ is defined as “a conveyance (other than a train, vessel or aircraft) capable of being propelled or drawn on wheels”. 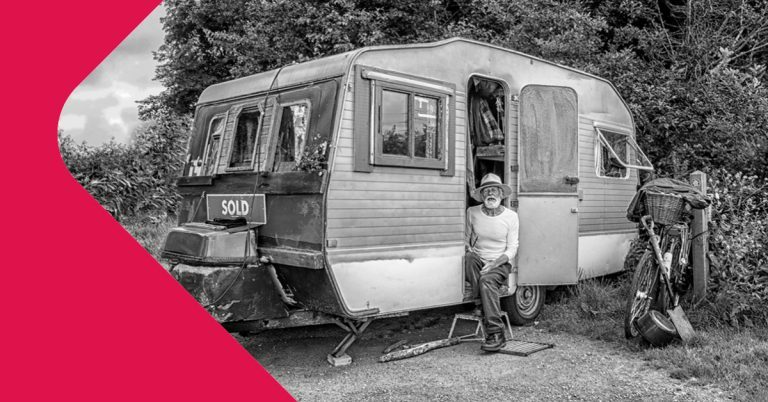 The Tribunal noted the coincidence of definitions of ‘caravan’ and ‘park home’ in the CC Act, and concluded that a park home is a type of caravan, as both must be vehicles and both must be fitted or designed for habitation. The term ‘conveyance’ is not defined in the CC Act or the CC Regulations. The Tribunal observed that the Macquarie and Oxford English Dictionaries respectively define the noun ‘conveyance’ as a means of conveyance and a means of transport from place to place. that conveyance or means of transport must be the function of the wheels of that object for the purposes of the CC Act and CC Regulations. Both a caravan and park home must meet this definition. it must be fitted or designed for habitation. Only the first two of these tests were significant in Henville. (1) A caravan in respect of which a vehicle licence is not required under the Road Traffic (Vehicles) Act 2012 section 4, because it could not be drawn by another vehicle on a road due to its size, is a vehicle of a prescribed class or description for the purposes of the definition of “park home” in section 5(1) of the Act. because the caravan cannot be drawn by another vehicle on a road as defined by the Road Traffic (Administration) Act 2008 (WA) (RTA Act) due to its size. The Tribunal held that there must be a causal link between the size of the park home (caravan) and its inability to be drawn along a road, so that the vehicle is not required to be licenced pursuant to s.4(1) of the RTV Act. The cause or reason why the vehicle is not required to be licenced pursuant to s.4(1) of the RTV Act cannot be because of some other reason. The Tribunal examined the requirements of, and interaction between, the RTA Act and RTV Act and regulations. Section 4(1) of the RTV Act provides that a vehicle licence is required for a vehicle of a prescribed class. Section 4(2) of the RTV Act provides for an offence if the vehicle is subject to s.4(3), (4), and (5) of the RTV Act. The words ‘vehicle’ or ‘vehicle of a prescribed class’ are not defined in the RTV Act. However, s.3(2) of the RTV Act provides that the RTV Act incorporates the definitions provided for in the RTA Act when words are not defined by the RTV Act. Section 5 of the RTA Act provides that the definition of ‘vehicle’ includes “every conveyance, not being a train, vessel or aircraft, and every object capable of being propelled or drawn, on wheels or tracks, by any means[. ]” This is a similar, but wider, definition to that provided for in s.5(1) of the CC Act. Regulation 15(1) of the Road Traffic (Vehicles) Regulations 2014 (WA) (RTV Regulations) prescribes the vehicles for the purposes of s.4 of the RTV Act, and provides that a vehicle licence is required for a vehicle that is a ‘motor vehicle’ and a ‘trailer’. The Tribunal concluded that, prima facie, a ‘caravan’ and therefore a ‘park home’ fall within the definition of trailer. while ‘axle’ is not defined in the RTV Act or RTV Regulations, it is defined in the RTA Act to mean “one or more shafts positioned in a line across a vehicle, on which one or more wheels intended to support the vehicle turn”. None of these facts, calculations or measurements were the subject of evidence or information before the Tribunal. The Tribunal found that the shafts around which the metal rollers rotate on the applicant’s structure did not extend the width of that structure and did not therefore meet the definition of ‘axle’ pursuant to s.3(2) of the RTV Act. The Tribunal noted that the applicant did not provide the Tribunal with such a certificate or produce any expert evidence of the structural integrity and adequacy of the design of anything that is a chassis, axle, or wheel to bear the weight of the structure without structural alteration or damage. The Tribunal commented that photographs in exhibit depicted a form of habitation similar to that proposed by the applicants that required significant repairs because of damage to that structure from an attempted transport of the structure onto the property. The Tribunal concluded that the modification to include the metal rollers and removable tow hitch on the depicted structure was suggestive of mere affection to give the appearance of compliance with the definition of a park home for the purposes of the CC Act and Regulations. so as to be capable of being drawn by another vehicle on a road by utilising the functions of its wheels. The Tribunal held that if it is a trailer that is not capable of being drawn along a road because it cannot be licenced pursuant to s.4 of the RTV Act because it does not meet the regulatory requirements of the RTV Regulations, it cannot be a park home regardless of its size. If it is an object that is moveable, rather than a means of transport, it fails to meet the essential element of what is a ‘vehicle’ under both the RTV Act and RTV Regulations and the CC Act and CC Regulations. Member Owen-Conway stated that the renaming of the structural frame as a ‘chassis’, the metal pipes used as rollers ‘wheels’, and the pivot point of the rollers as ‘axles’ in the applicant’s drawings did not turn the structure as a matter of law and fact, into a vehicle, a trailer, and a park home. The Tribunal held that that applicant’s proposed habitable structure was not a vehicle because it was not a means of transport, and even if it were a vehicle the Tribunal was not satisfied the applicant’s proposed structure was capable of being drawn along a road regardless of its size. There was no evidence that it met any of the regulatory requirements of the RTV Regulations so as to be otherwise capable of being licenced pursuant to s.4 of the RTV Act but for its size. The Member concluded that the applicant’s proposed form of habitation was a building. The decision made by the City of Armadale to refuse the applicant’s application for the grant of a park home park licence pursuant to s.7 of the CC Act was affirmed by the Tribunal.